TYT contributor Stewart E. Rogers Jr. from Greenville South Carolina, has been a resident of Mahahual, Quintana Roo (a region also known as Costa Maya) for several years now, he lived in Belize for 2 years, and runs the costamayalife.com news blog. 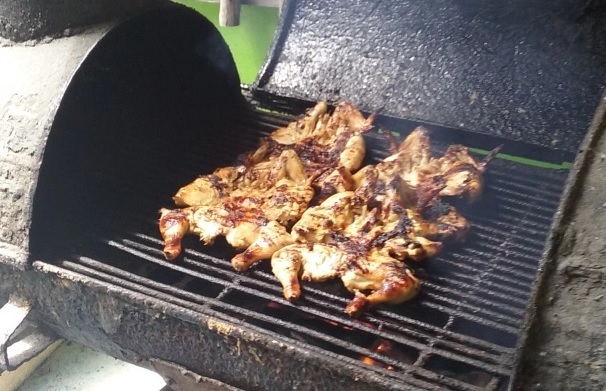 He recently published a peculiar story of an ocassional conversation he had with another guy, while standing in line to get some fried chicken in Mahahual. I was at K’ay Kook Hotel watching college football. At halftime I ran up to the corner to get some chicken. I am standing there while they cook my chicken on the grill, and this guy that I have seen around, hangin out on the malecon, and other places in town was standing beside me. So I introduced myself, even though I was pretty sure he knows who I am. He asked me some questions about what I do and everything. We then got around to the topic that I used to live in Belize. He said he did also, and he lived in Corozal. I told him I used to live in Corozal, and he said he knew, he had seen me there. So I asked: “what brings you to Mahahual?” and then he told me, “I got shot in Belize, so I left”. Then, the guy showed me his arm where he got shot. He said after that, he decided to leave and come here. He then told me Belize has gotten real dangerous. I then told him, “Tell me about it”, grabbed my lunch and headed back home in a hurry, second half was already on. I did not ask him where or why he got shot, just told him, I will see him around. I swear you can’t make these things up.